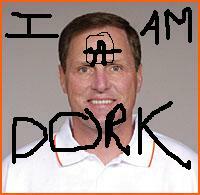 I found this at College Game Balls (a Virginia Tech blog) and it is made by the genius, LSU Freek. Recently it was announced that Notre Dame would not play The Golden Gophers in the future. This was a decision made by Kevin White (ND A.D.), because it did not fit in with his scheduling plan. O.K. fair enough. But apparently it does not rub well with new Minnesota Head Coach Tim Brewster. The following is a post found on NDNation.com. It may or may not be true… but how does one make this stuff up? So I just moved into a new apartment, and it so happens that Tim Brewster, the new U of MN coach, lives in the same place. Last week there was a “meet and greet” for the coach, and he gave his spiel about how great things would be for the MN Gophers, how they were changing the program around, and how excited they were to be moving into a new stadium in ’09. He repeatedly made the statement “we need to keep Minnesota players in Minnesota” and told the crowd if anybody was from Cretin-Derham, to spread that message. I went up to him afterwards and told him congrats and good luck, but that I was from ND and we might be recruiting the same Minnesota players. In what I can only describe as bizarre, Brewster basically went off on me, saying how sick he was Notre Dame and our arrogance, pompous attitudes, and fear of playing Minnesota in their new stadium. When I told him it was the collective opinion of ND fans that it was our athletic director who wouldn’t budge the schedule, he went off on Weis of all people, called him a “slob, a disgrace to Notre Dame, with his dirty mouth and appearance” or something similar. He said Notre Dame could never recruit another Minnesota player until Weis was under 350 pounds. This whole time I was kind of in awe that another D1 coach could be so tactless, especially around somebody who he had never met. I should have asked him if had a Notre Dame opt out clause in his contract, like Holtz. Oh well. But now I really wish we would play them in for their first game in the new stadium. Truly, jaw dropping. Now imagine what he says to recruits about Weis and the Irish. I hope Floyd has earplugs. High schools kids should not be subjected to what is clearly an elementary mind. Tim Brewster…you are a dork. You saw this coming, right? Have you been saving up the comebacks? For as long as Notre Dame has had its T.V. contract with NBC, the fans of the Big Integer have dogged ND about it. Well, maybe their contempt was out of pure jealousy. Hey Everyone,On Monday, May 21st, I will be sending you an open letter from Mark Silverman, president of the Big Ten Network regarding some key questions/answers that Big Ten fans have about the network. Also, we are planning an open Webchat with Mark Silverman on the www.BigTenNetwork.com site on Thursday, May 24th at 1:00 p.m. EDT. I hope you can join us. If possible, will you please share this letter and promote the Webchat on your individual sites, it would be much appreciated. Also, we are planning something special for you all in support of the network. If you have any questions in the meantime, please feel free to contact me. Bribery. Get the word out and get some treats. The best news about this new network is that the great games of Indiana VS. Northwestern or Illinois VS. Minnesota will now be seen on their network and not on ESPN. Now ESPN can fill its slots up with Duke VS. East Carolina or Baylor VS. Rice. This is of course, an obvious cash grab for another greedy conference. Yes, this network is going to show more than just football, but let’s face it…football is king and the nucleus. This is another direction the big conference schools are going to further line their pockets with dough. This is why you will NEVER see a playoff in 1A or even a plus one game. Say what you will about ND and NBC. The fact is, is that ND goes with the flow of the other Universities and does what it must to survive as an independent. The conferences are trying to do all they can to destroy that. Their money means control and to do things their way. If it weren’t for the NBC contract, ND may be forced into doing things it doesn’t want to do as far as scheduling and so forth. Try as they might, no Big Integer school will EVER have the draw or the prestige of ND… but they will try. You are currently browsing the archives for the Big Integer category.